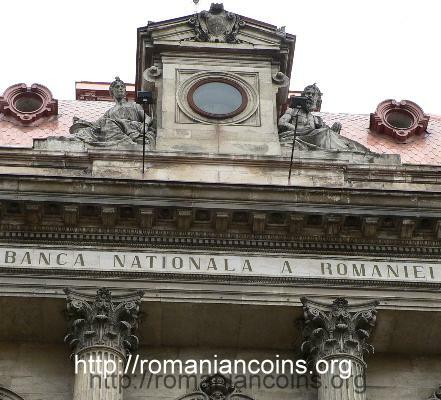 Obverse: face value 10 LEI, coat of arms of Romania, year 2010, ROMANIA, detail of the facade of the old Palace of the National Bank of Romania (above main entrance), inscription "PALATELE BUCURESTIULUI" meaning "PALACES OF BUCHAREST" Reverse: an image of the old Palace of the National Bank of Romania, above and below adornments from inside the building, circular inscription "BANCA NATIONALA A ROMANIEI PALATUL VECHI" meaning "NATIONAL BANK OF ROMANIA OLD PALACE"
Obverse: face value 10 LEI, coat of arms of Romania, year 2010, ROMANIA, detail of the facade of the Palace of Justice and one of the statues on the facade, inscription "PALATELE BUCURESTIULUI" meaning "PALACES OF BUCHAREST" Reverse: image of the central part of the Palace of Justice, below a detail with the clock on the roof (above the main entrance) on which years 1890 - 1895 when the building was erected, inscription "PALATUL DE JUSTITIE" meaning "PALACE OF JUSTICE"
Obverse: ROMANIA, face value 10 LEI, year 2010, coat of arms of Romania, detail with the adornment of the roof of the Palace of the Chamber of Commerce and Industry and of the Stock Exchange, inscription "PALATELE BUCURESTIULUI" meaning "PALACES OF BUCHAREST" Reverse: an image of the Palace of the Chamber of Commerce and Industry and of the Stock Exchange, below a detail with the statues on the frontispiece, inscription "PALATUL CAMEREI DE COMERT SI INDUSTRIE SI AL BURSEI" meaning "PALACE OF THE CHAMBER OF COMMERCE AND INDUSTRY AND OF THE STOCK EXCHANGE"
The National Bank of Romania's building in Bucharest was raised between 1884 and 1890, after the plans drawn up by French architects Paul-Luis Albert Galleron (1846-1930) and Marie-Joseph Cassien Bernard (1848 - 1936). The building is of eclectic style with neoclassic elements, thus typical to the end of the 19th century. 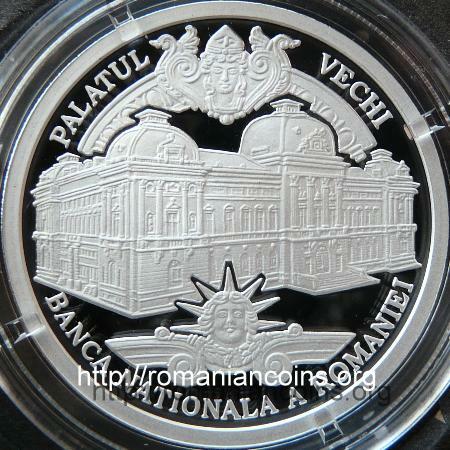 The old Palace of the National Bank of Romania appears on many anniversary Romanian coins (five in 2010 only! 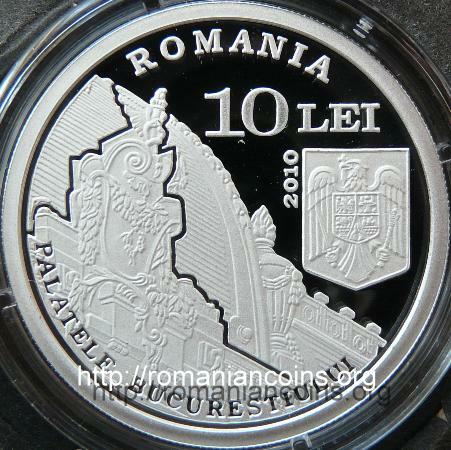 ): 500 lei 2005 - 125th Anniversary of the National Bank of Romania, 1 leu, 10 lei and 200 lei 2010 - 130 Years since the Establishment of NBR and 100 lei 2010 - Eugeniu Carada - Founder of the National Bank of Romania. 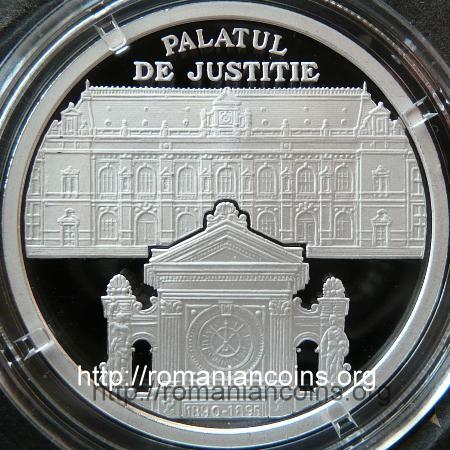 The plans for the Palace of Justice were made by French architect Albert Ballu (1849 - 1925), but the building was finished by the Romanian architect Ion Mincu (1852 - 1912). 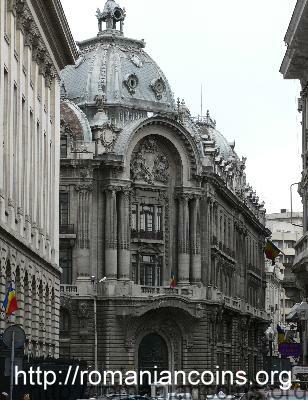 The foundation stone of the building was layed by king Carol I of Romania on 7th of October 1890. 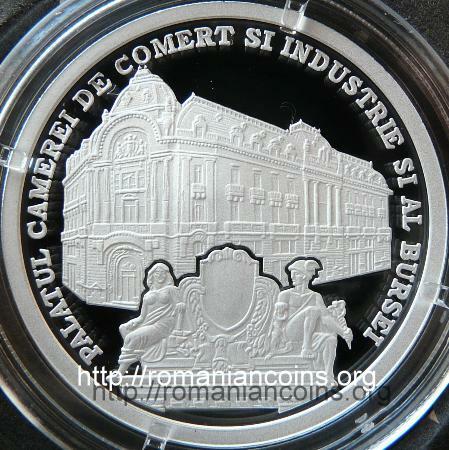 The masonries were made by the firm of Romanian engineer Nicolae Cuţarida, who also issued several tokens with this occasion. 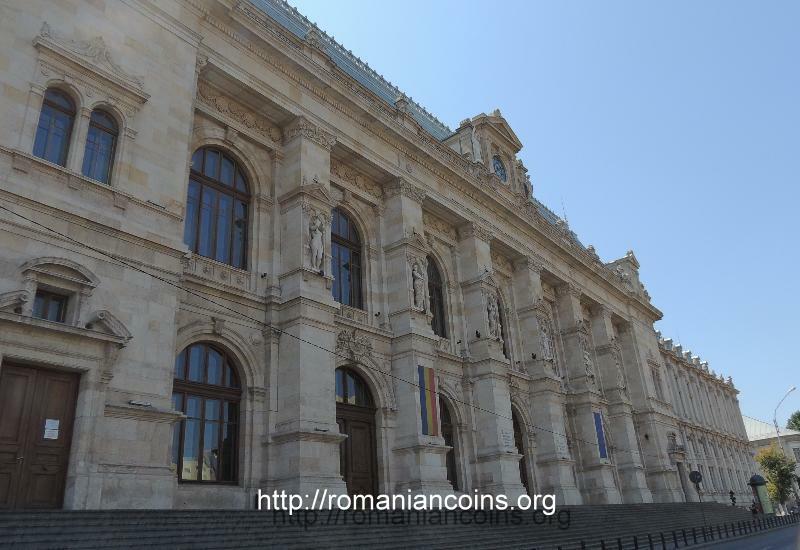 Inside the palace there is a Hall of Lost Footsteps (just as inside the Palace of the University of Iaşi). 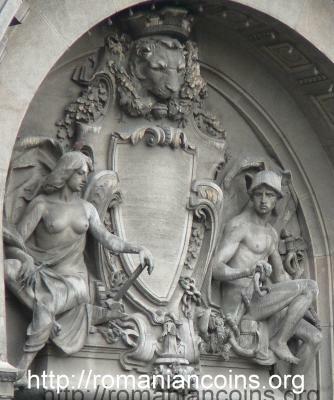 The facade of the Palace of Justice is adorned with several statues representing allegories: Law, Rightfulness, Justice, Truth, Force and Prudence, sculpted by the Romanian sculptors Carol (1854 - 1926) and Frederic (1872 - 1942) Storck. 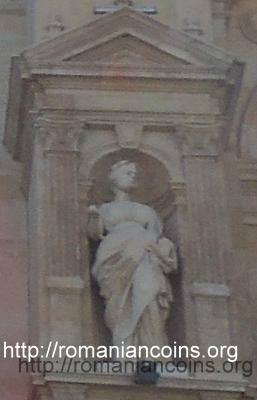 One of these statues - maybe Prudence - appears on the coin's obverse. 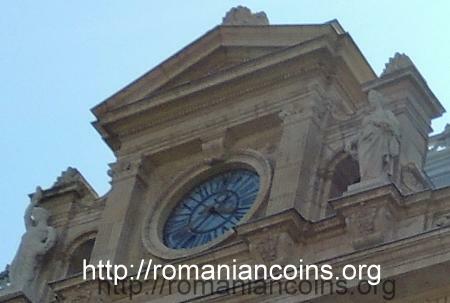 Another two statues flank the clock on the roof - maybe Vigilance and Elocution. 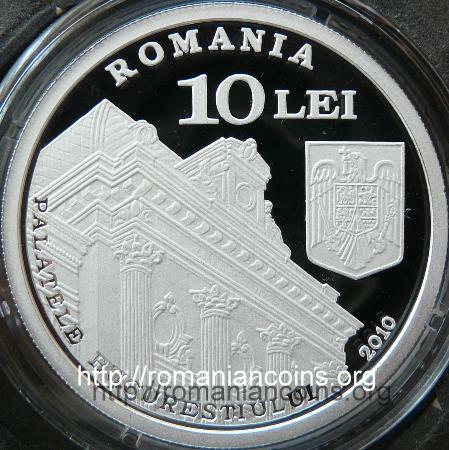 It is the work of Romanian architect Ştefan Burcuş (1870 - 1928). The construction began in year 1907, having been inaugurated in 1911. 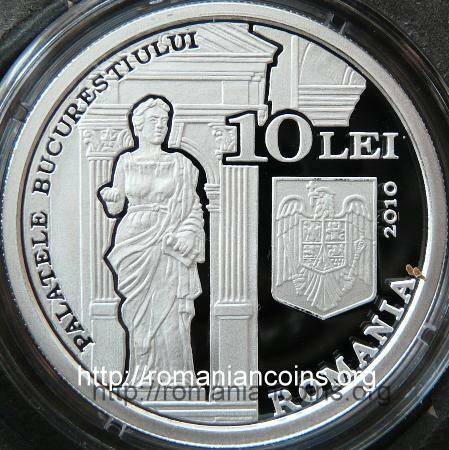 The statues on the frontispiece - Roman god Mercury, at right, and a personification of Industry, at left - that appear on the coin, are the work of Romanian sculptor Emil W. Becker (1881 - 1952; his signature appear on several gold anniversary coins from years 1939 and 1940). 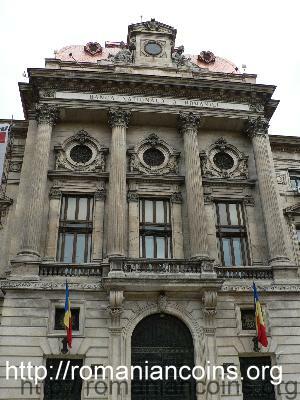 Between 1955 and 2008 the National Library of Romania functioned in this palace.